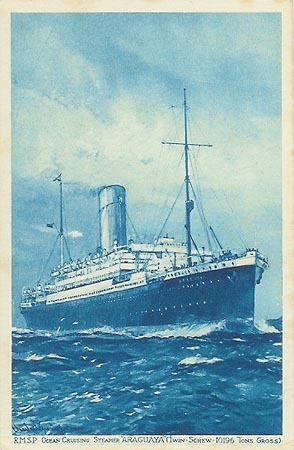 This page is one of a series devoted to postcards and photographs of the Royal Mail Steam Packet Company (RMSP). An alphabetical list of ships shown on this page is shown below. Below this is a Fleet List in chronological order. There is a table of individual ship histories on the RMSP Header Page. RMSP - Page 2 - 1900-1923 - this page! 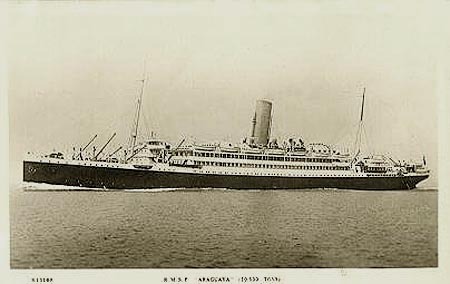 Aragon (1) was torpedoed and sunk off Alexandria in 1917. 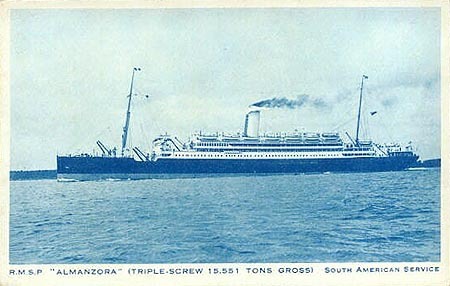 RMSP postcard of Aragon (1). 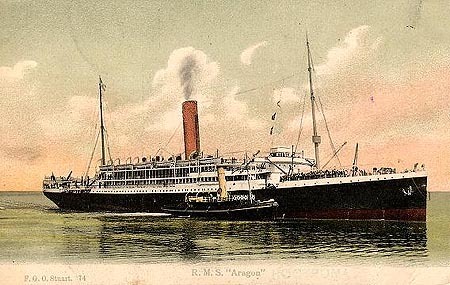 F.G.O.Stuart postcard of Aragon (1). 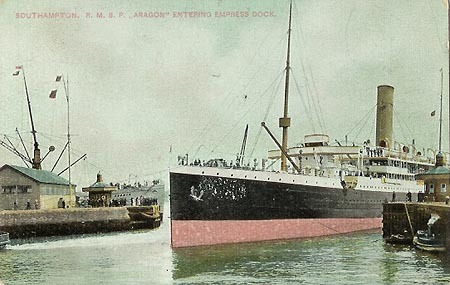 Tuck's postcard of Aragon (1) at Southampton's Empress Dock. Photographic postcard 219 of Aragon (1). 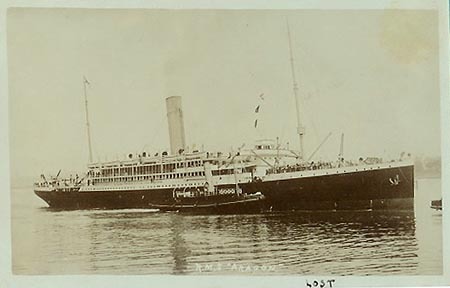 Amazon (2) was torpedoed and sunk off Ireland in 1918. Photographic postcard of Amazon (2). 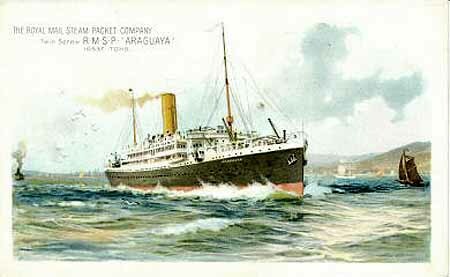 RMSP art postcard of Araguaya. 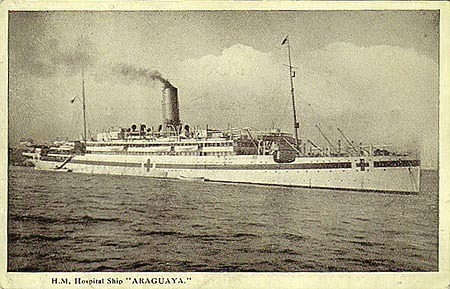 Postcard of Araguaya as a hospital ship. 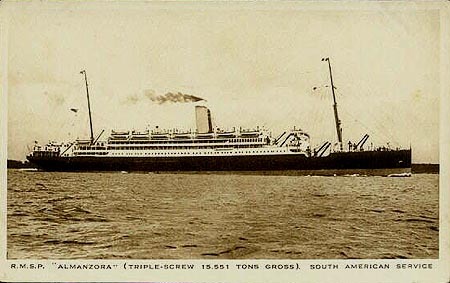 Sisterships Orizaba and Oroya (2) were designed by the Pacific SN Co for the joint Australian service with Orient Lines. As built, they were 6050 gross tons and 466 feet long, and passenger totals were:- 126-1st, 154-2nd and 412-3rd. Tonnage later increased to 6300 gt and funnels were lengthened in 1905. 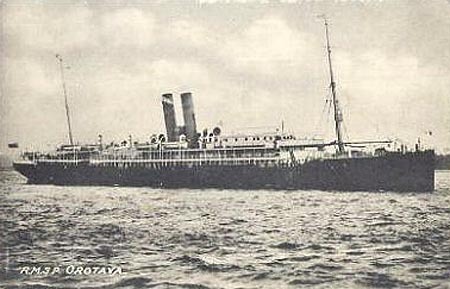 In 1895, Oroya (2) was stranded in the Bay of Naples. 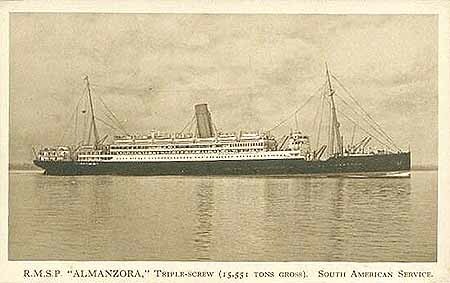 On 15th February 1905, Orizaba ran ashore on Garden Island, near Fremantle, and became a total loss. 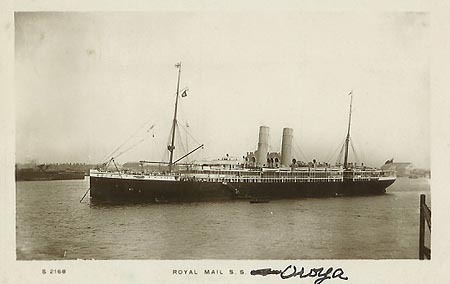 Surviving sister Oroya (2) passed to Royal Mail for Orient-Royal Mail service in 1906. They were built with four masts, but Royal Mail removed the the second and third from Oroya (2). 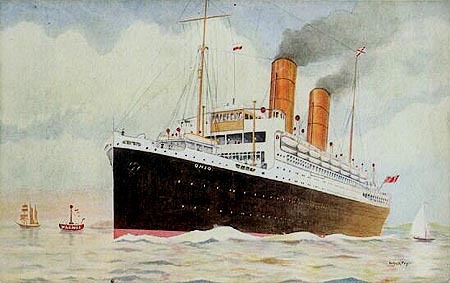 She was scrapped in 1909. 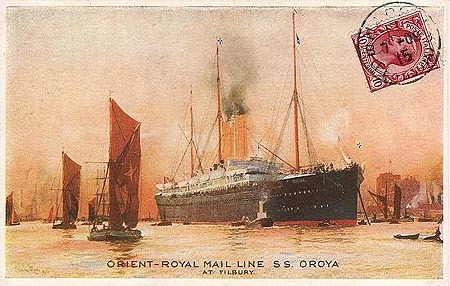 Orient-Royal Mail postcard of Oroya (2) at Tilbury. Kingsway postcard S2168 of Oroya (2) in Royal Mail service after 1906. 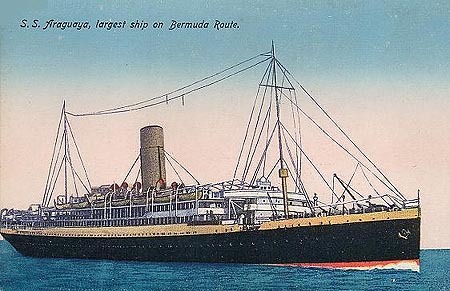 Orotava and Oruba were designed by the Pacific SN Co as smaller versions of Orizaba with funnels placed closer together. They were built for the Valparaiso trade and re-allocated to the Australian run in in mid-1890. They were 5850 gross tons, 430 feet long and passenger totals were:- 126-1st, 120-2nd and 400-3rd. 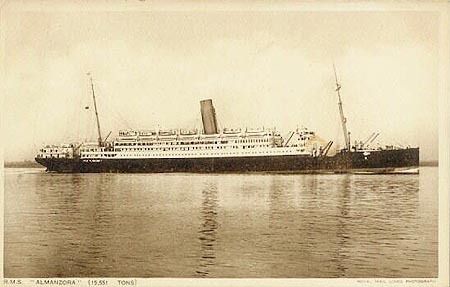 In 1896, Orotava capsized in Tilbury, but was raised for further service. 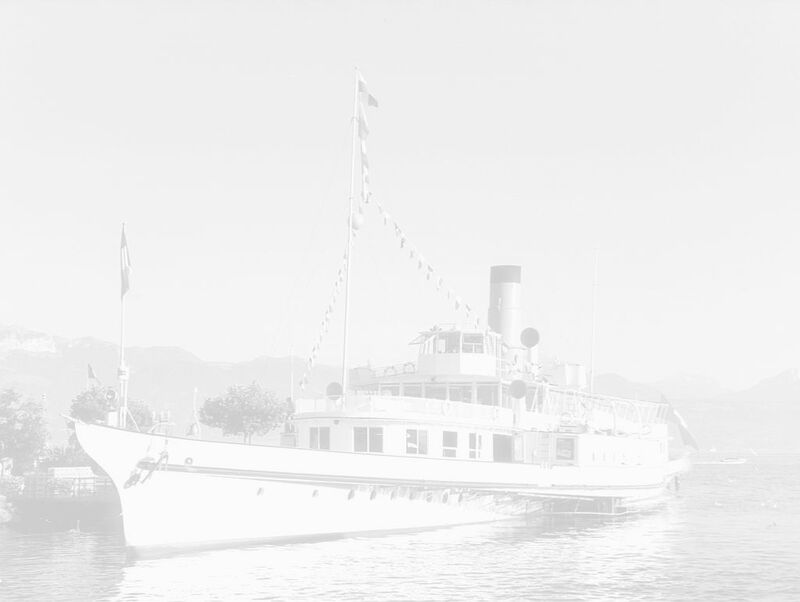 She was used for Boer War trooping between 1899-1903. They passed to Royal Mail in 1906, and their second and third masts were removed. 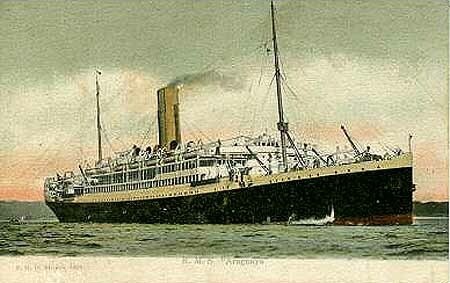 From 1909 they served on the West Indies route. 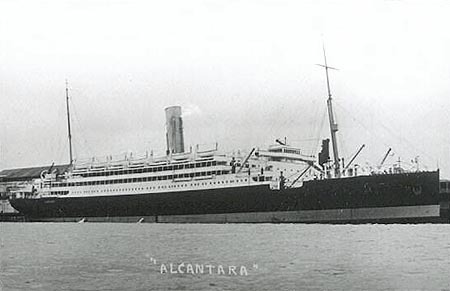 Orotava became an armed merchant cruiser in WW1, and was scrapped afterwards in 1919. Oruba was taken over by the Admiralty for conversion as a dummy replica of the battleship Orion, and was later scuttled to form a breakwater in the Aegean. 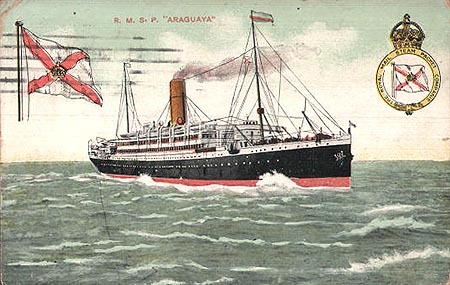 Postcard of Oruba in Royal Mail service with two masts. 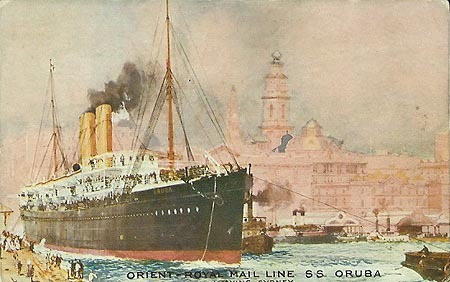 Official Orient-Royal Mail postcard of Oruba with two masts. 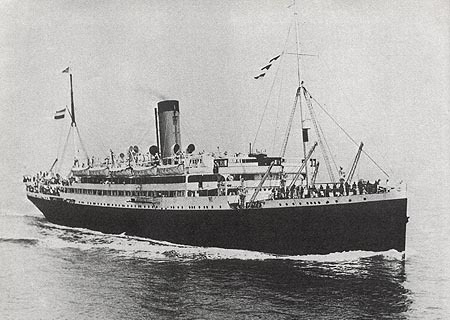 Ortona was built by Pacific SN Co for the Australian run. 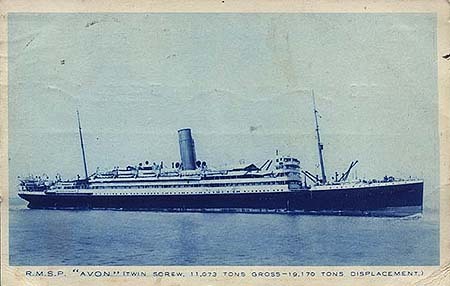 She was 7950 gross tons and 500 feet long, carrying 130-1st, 162-2nd and 300-3rd class passengers. 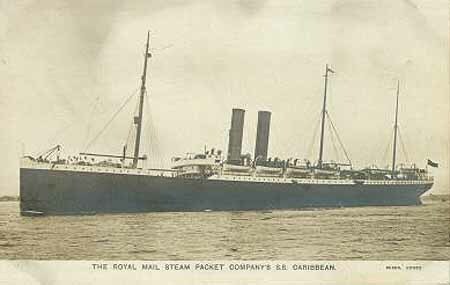 She passed to Royal Mail in 1906, and was used briefly on their West Indies route. 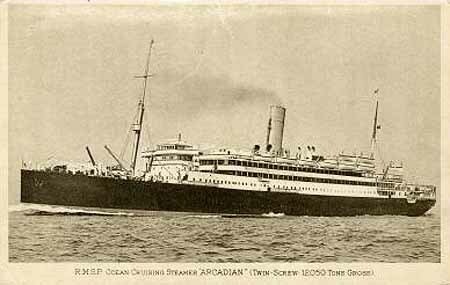 In 1910 she was rebuilt as the cruise ship Arcadian (8950 gross tons, 320 First Class passengers). 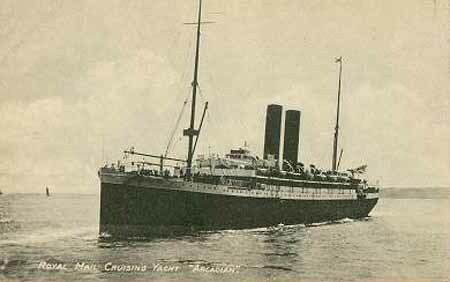 She was sunk by a submarine in 1917 whilst on trooping duty. 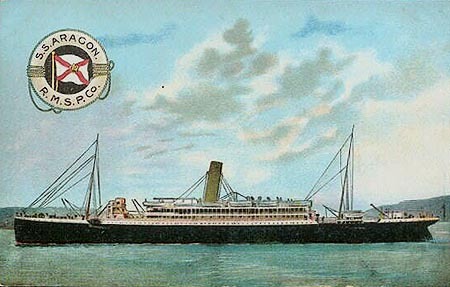 Tuck's "Celebrated Liners" postcard of Ortona in Pacific SN Co service. 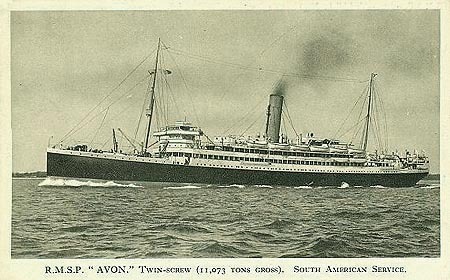 RMSP postcard of Avon . RMSP postcard of Asturias (1). 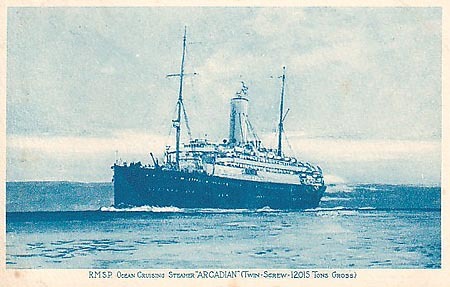 RMSP postcard of Arcadian, ex-Asturias (1). 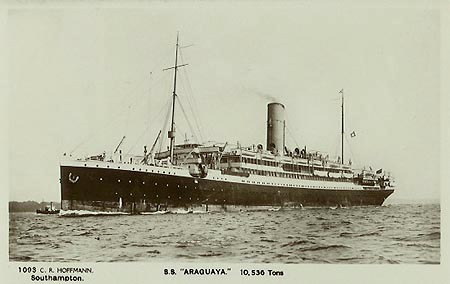 Photographic postcard of Arcadian, ex-Asturias (1). 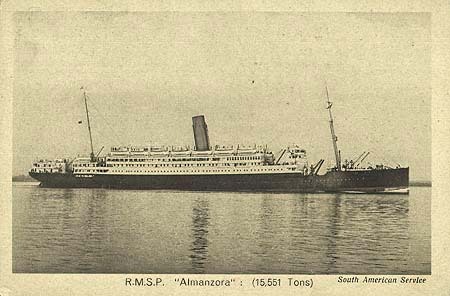 RMSP postcard of Arlanza (1) - sepia version. 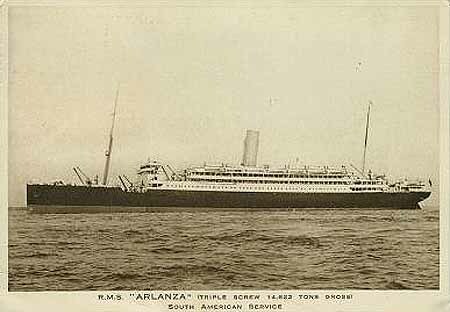 RMSP postcard of Arlanza (1) - blue version. 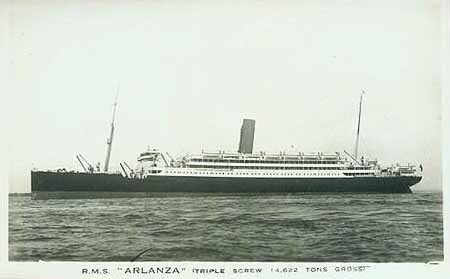 RMSP postcard of Arlanza (1) - a third variation on the image used in the cards above. 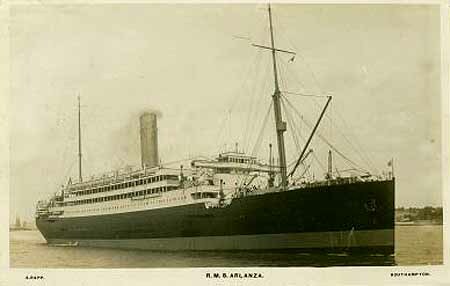 Photographic postcard of Arlanza (1). The 1911/12 D-Class were smaller versions of the A-Class for secondary services. Royal Mail official for the D-Class. 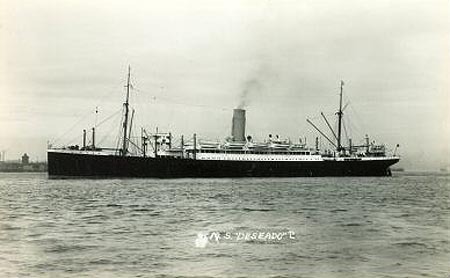 Photographic postcard of the Deseado. 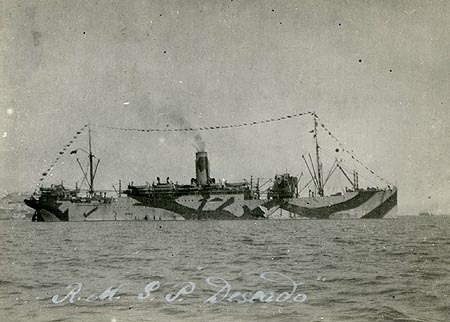 Photograph of the Deseado in wartime camouflage. 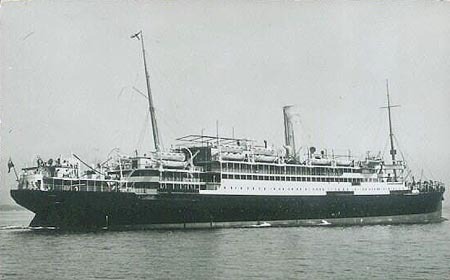 Caribbean was built as the Dunottar Castle in 1889 for the Castle Line, passing to Union-Castle in 1900. Union-Castle became part of the Royal Mail Group in 1912, and Dunottar Castle was sold to Royal Mail the following year as the Caribbean. 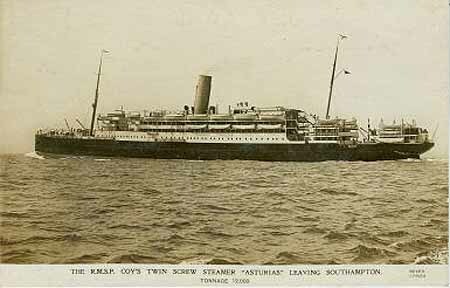 In 1914 she was taken over for use as an Armed Merchant Cruiser, and later Scapa Flow depot ship. 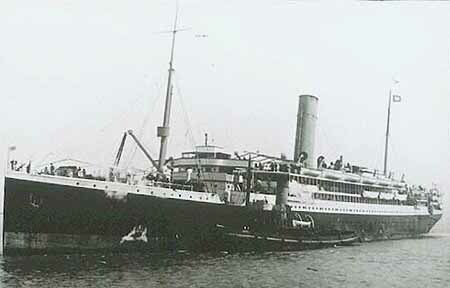 In 1915 she sank off Cape Wrath. Royal Mail official card of Andes (1). 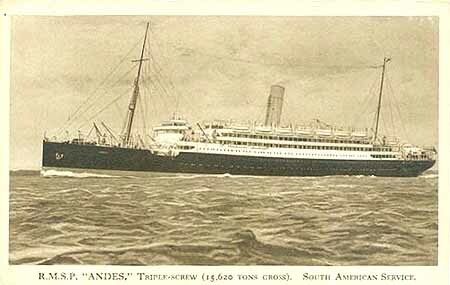 Photographic postcard of Andes (1). 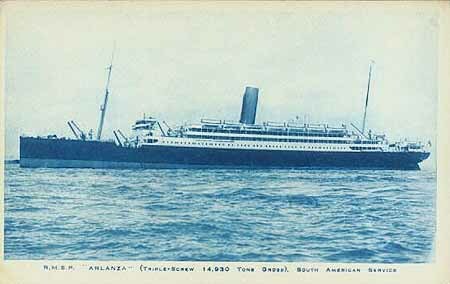 Royal Mail official card of Atlantis (ex-Andes). 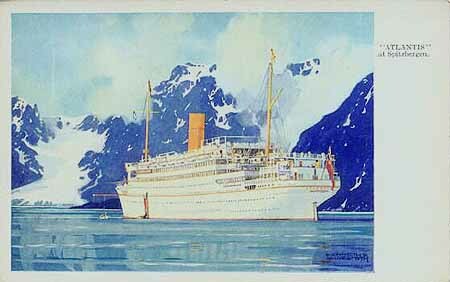 Royal Mail official card of Atlantis at Spitzbergen. 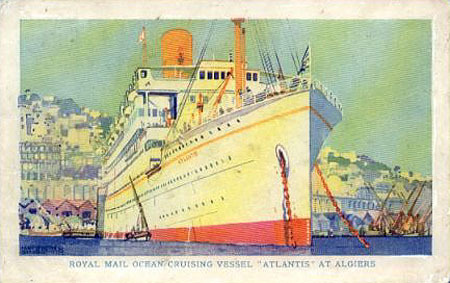 Royal Mail official card of Atlantis (ex-Andes (1)) at Algiers. 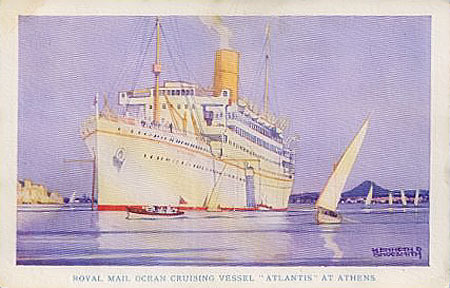 Royal Mail official card of Atlantis at Athens. Essequibo was built for the PSNCo parent company Royal Mail in 1914. 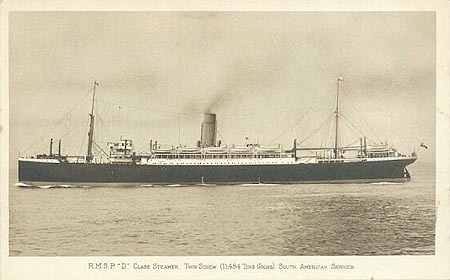 She was transferred to the PSNCo in 1922. In 1935 she was sold to the USSR as the Neva. 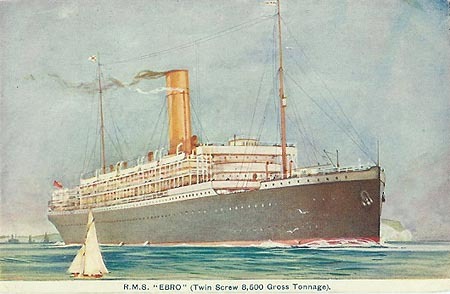 Ebro was built for Royal Mail in 1915, and was transferred to the PSNCo in 1922. She became the Princeza Olga of Jugoslavenska Lloyd in 1935, and the Serpa Pinto of Companhia Colonial de Navegacao from 1940-1955. Photograph of Princeza Olga of Jugoslavenska Lloyd (1935-1940). 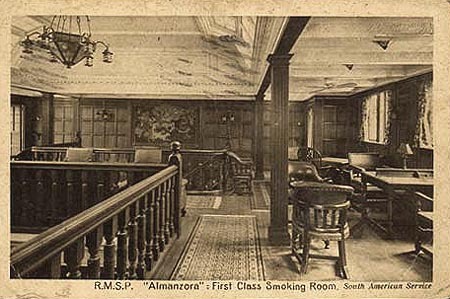 RMSP postcard of Almanzora (variation on card above). Ohio was oredered as the Munchen for Norddeutsche Lloyd. 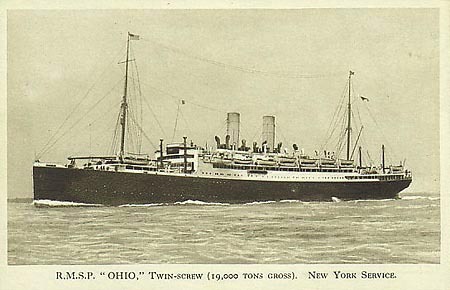 She was completely after the war as the Ohio of RMSPCo, and used on their Hamburg-New York service. 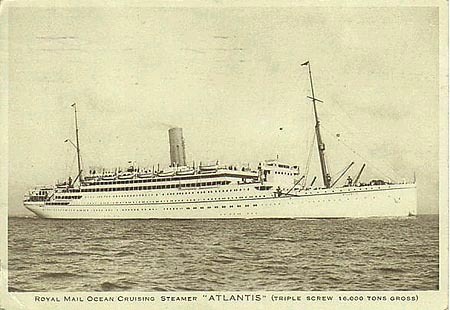 In 1927 she was transferred to White Star as the Albertic, and was scrapped in 1934. Official RMSPCo postcard of Ohio. 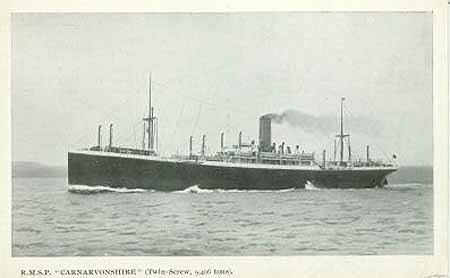 Oruba (2) was built as the Marathon in 1904 for the Aberdeen Line. She was purchased by Royal Mail in 1920 and renamed renamed Oruba (2). 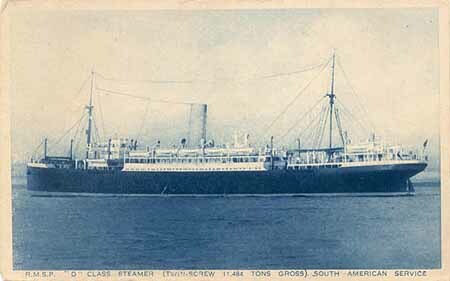 In 1922 she was trasnsferred to the PSNCo and scrapped two years later. 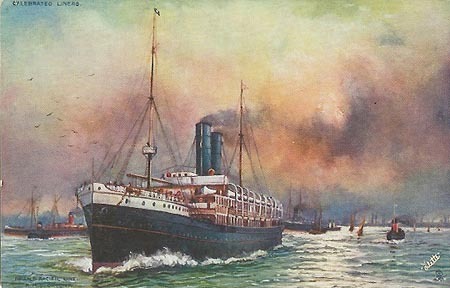 Similarly, the Orcana had been the Aberdeen Line Miltiades of 1903, and was purchased by Royal Mail in 1920. 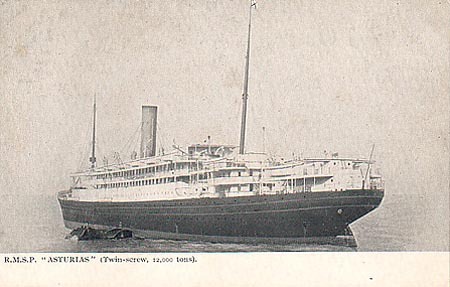 She was transferred to PSNCo in 1922, but scrapped two years later. 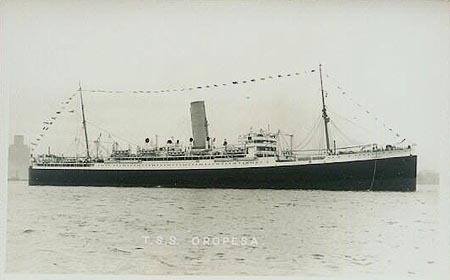 Oropesa (2) was chartered to parent company Royal Mail between 1921-22 for their New York service. 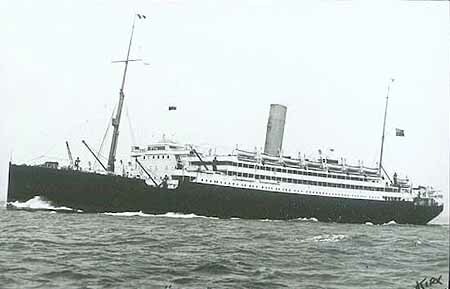 She was torpedoed and sunk off Ireland in 1941. 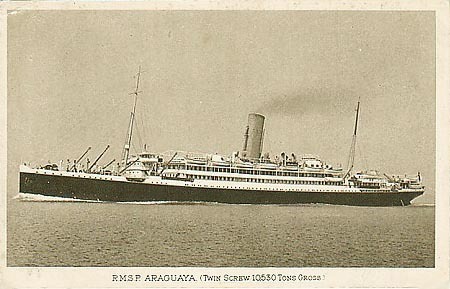 Orduña, Orca and Orbita were built for the PSNCo South American services in 1914, 1918 and 1919 respectively. Their ownership passed to Royal Mail in 1910, with the rest of the PSNCo fleet, but they initially remained in PSNCo service. 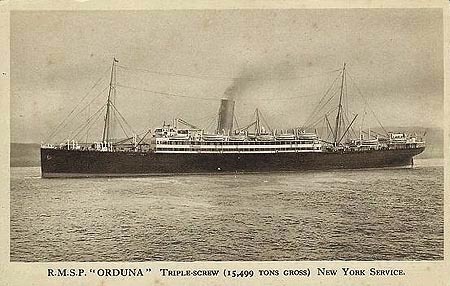 Orduña was transferred from PSNCo to Royal Mail for their Hamburg-New York service in 1921, reverting back to PSNCo in 1927. 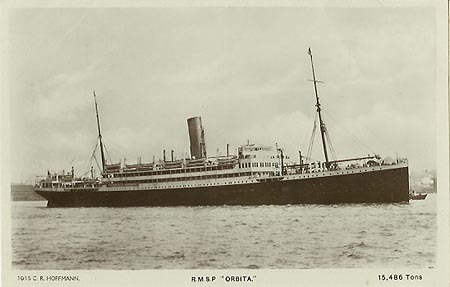 Orbita was chartered from PSNCo for Royal Mail's Hamburg-NY service in 1921, and fully transferred in 1923. In 1927 she reverted to PSNCo. 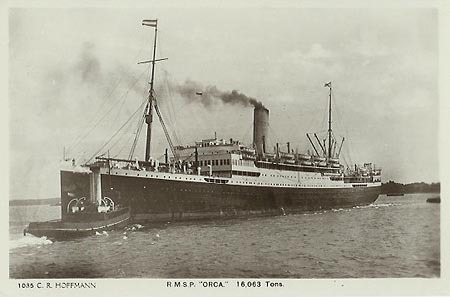 Orca transferred to Royal Mail from PSNCo in 1923. 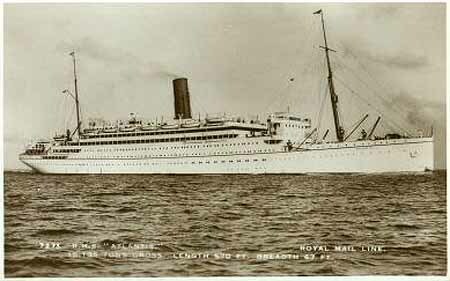 In 1927 she was sold to White Star Line, and renamed Calgaric. 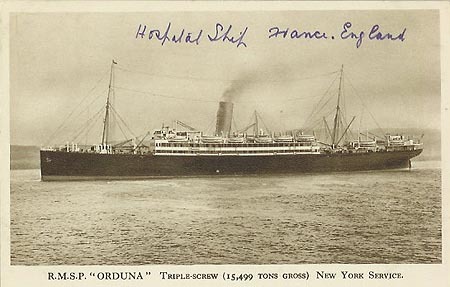 Official postcard of Orduña in Royal Mail service to New York. 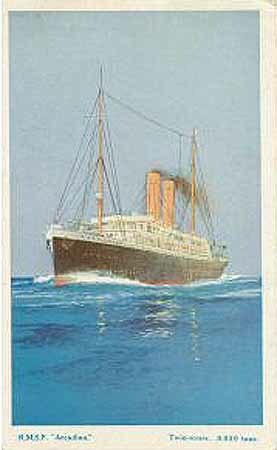 C.R.Hoffman postcard of Orduña in Royal Mail service. 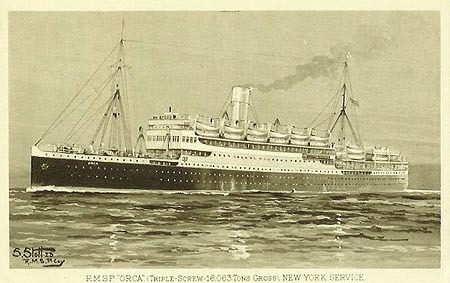 Official postcard of Orca in Royal Mail Lines service to New York. C.R.Hoffman postcard of Orca in Royal Mail service.